Editor's Note: Your editor left a comment on the Cardinal Archbishop's website commending him on the following statement. I also suggested he speak out as clearly against the "brutal and nasty" assault on pro-life Christians by the Governor and Mayor of New York, who have both suggested there is "no place" in New York for pro-lifers. Moments later, all comments were removed from the Archbishop's blog. Cardinal Dolan, apparently, sees best at a distance. Those high summer hopes have now turned as cold as this New York winter day. 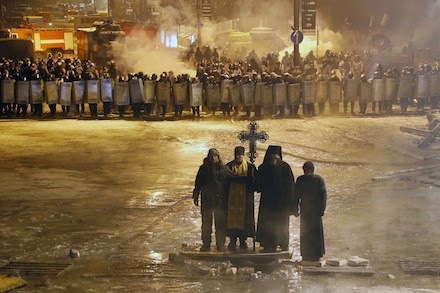 What began as inspirational, prayerful, peaceful, powerful protest, dubbed the Euro Maiden Movement, characterized by prayer and song led by Jewish, Orthodox, and Catholic clergy, has turned brutal and nasty, with government thugs relishing the chance to bludgeon and harass the hundreds of thousands of patriotic Ukrainians, and oppressive laws quickly passed to suppress freedoms.